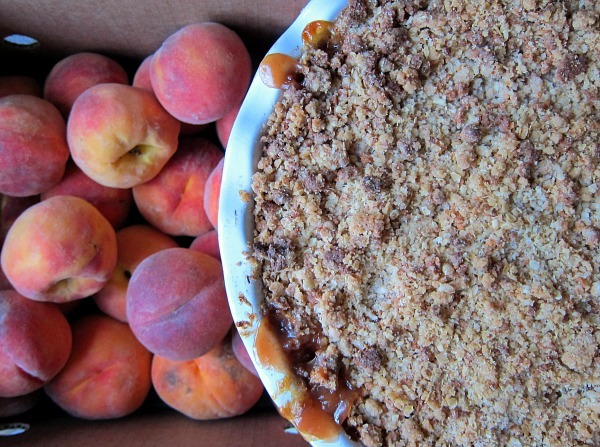 Embracing peach season, one bite, one recipe at a time. As a man who is partial to pie, I must admit my eyes have been wandering lately, gazing at the crisps, cobblers, slumps, buckles, and brown betties of summer. Just yesterday, I succumbed to some audacious flirting by a bowl of perfectly ripe peaches, and I made a quick crisp, a delicious peach macaroon confection well suited for a scoop of ice cream and second helpings. Say ‘Hello’ to Peach Macaroon Crisp! Why a crisp? Simply put, it makes seasonal fruit shine, is easy to make, and bakes up into the perfect combo of crunch, fruit and goo. 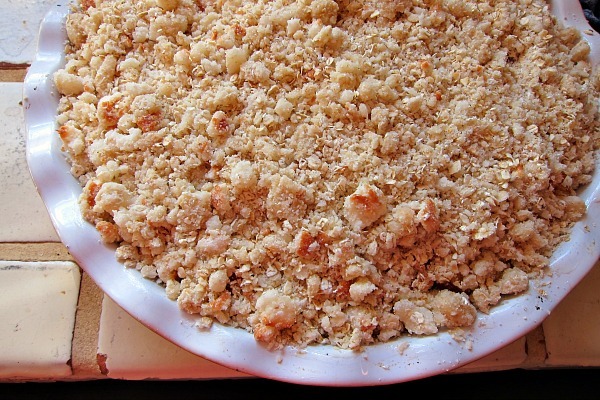 For those unfamiliar with a fruit crisp, there’s no bottom crust, just a top one. Juicy fresh fruit goes in the bottom of the pan or pie plate, then a mixture of flour, oats, sugar, and butter crowns the riches below. And in this case, macaroons, are added to the mix and tossed in for an added treat. 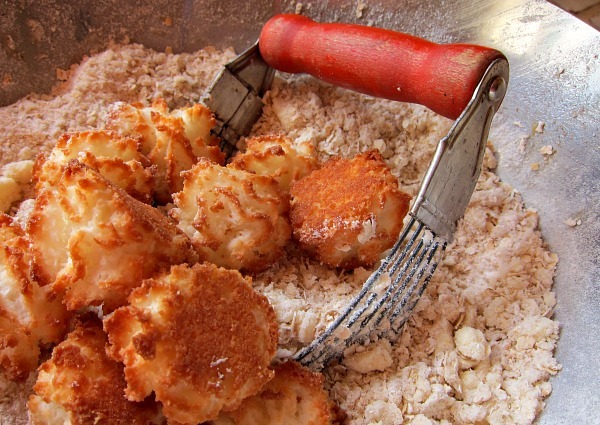 Cuckoo for coconut: In go the macaroons! Helping the cookie crumble with a dough blender. Peaches tucked in and ready to bake. A fine way to end the day. This recipe that is so easily modified that eventually you’ll make it from memory and personalize it to your own tastes. This dessert lends itself to any fruit and can be tampered with based on your own preferences. It's very forgiving. Wash peaches. No need to peel. Cut peaches into medium chunks. 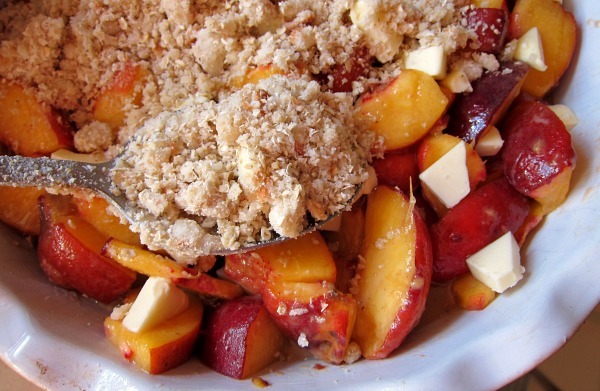 Place peaches in bowl, add 3 T flour and mix. Add 1/2 C sugar, nutmeg, cinnamon, and almond extract, and mix. 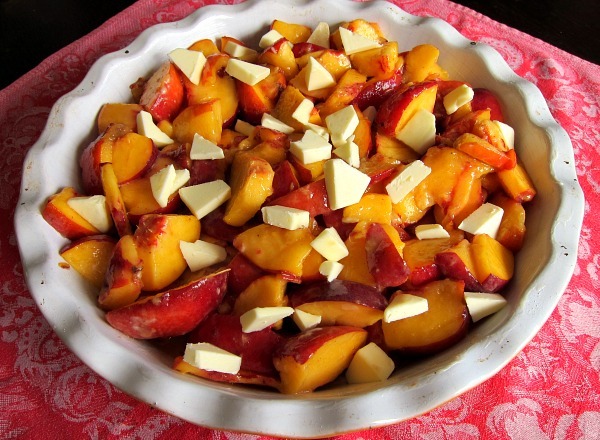 In buttered pie plate or baking dish, add peaches and dot with 1/4 C butter. In a bowl add all crumb topping ingredients: 1 C Flour, 2 C Oatmeal, 1 C sugar, 1/2 C soft butter, crumbled cookies, almonds, and mix thoroughly. Add oil, mix. 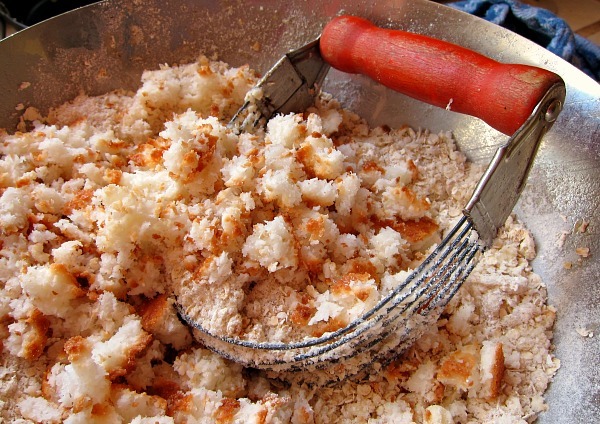 The topping will resemble wet sand. Spoon topping over fruit, and spread until about 1 inch thick. You'll have topping left over for another crisp most likely. Bake at 350 degrees, until peaches bubble around the pan edges, usually at least one hour, and up to one hour and a half depending on depth of pan. 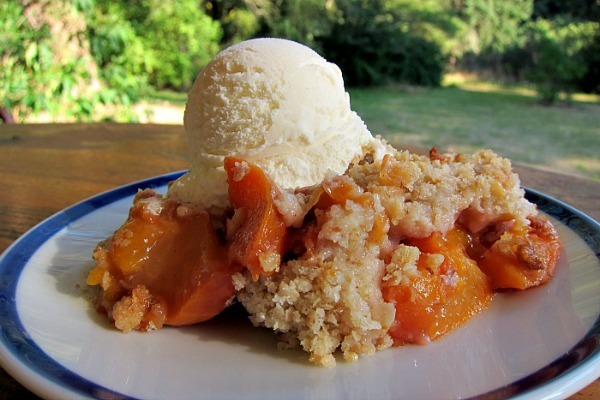 Summer’s not over yet, I have a few more peach recipes to share before autumn drops in with apples by the bushel. AIIIIIEEEEEEEEEEEEEE!!!!!!!!!!!! Sprinting to the kitchen to start making this …… oh no, need macaroons ……… sprinting to the store, drool spurting and feet stumbling in anticipation …..
Kathy, I love your enthusiasm; let me know how it goes. YUMMY Tommy! This looks heavenly!!!! Oh yes. I’d like to know where those macaroons were hiding because they would have never made it into my crisp! They would have been long gone. A very nice, tasty touch. Susan, that’s why I made it, so I wouldn’t eat the entire tray of macaroons in one day. This looks delicious. I would never have thought to use macaroons in a crisp (I’m English so I call them crumbles), but the combination of peaches and coconut sounds like a match made in heaven! 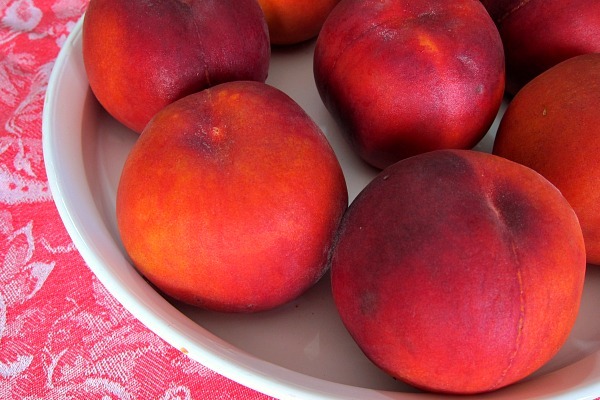 for those of us who don’t have access to a tree, how about a link to your post on how to ripen peaches? I’ve tried it and it works! Eileen, that’s what I was saying about your latest salad. Isn’t summer grand! I, being the recipient of a rather large slice of the above mentioned delicacy, hereby declare that I am PRO crisp. It tasted as good as it looks. Thanks Tom! Jeff, it was my pleasure — and thank you and Jacquie for a most delicious and deliciously memomarable summer evening. A friend just gave me a bunch of peaches, and I’d come across this post the other day. The stars are aligned….sort of. I cannot find the macaroons you have pictured. I know exactly what they’re like, but neither store in town has those. They have ‘macaroon cookies’…imposter macaroons, I say. I’m wondering if it’s a regional thing. Nevertheless, I’ll be making this tomorrow, sans authentic macaroons. Carol I bet the imposter macaroons will work just fine. Maybe just add a little coconut to the mix. Good luck, let me know how it goes.